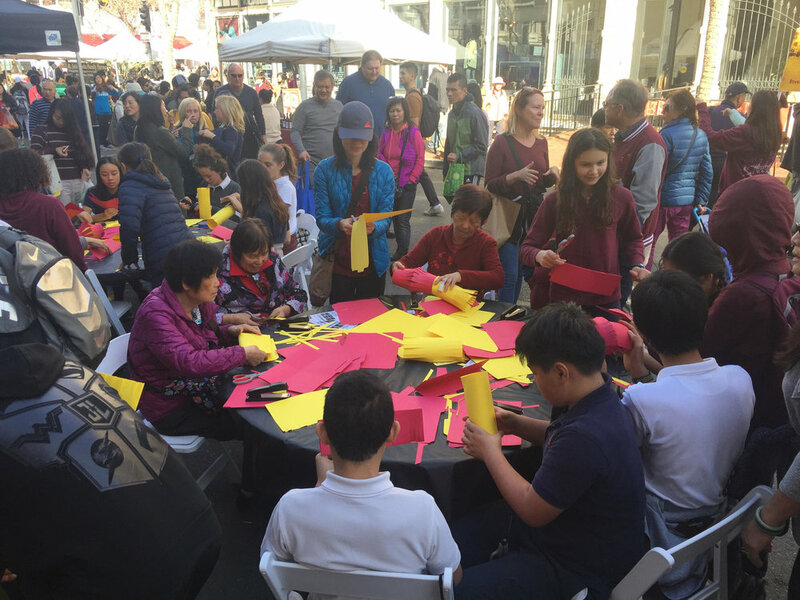 The Chinatown Improvement Initiative is a series of low cost, high visibility projects that demonstrate how Oakland Chinatown can be clean, safe, and well-maintained for Businesses, children, families and visitors. A clean and welcoming environment makes families, shoppers and visitors feel safe and improves business and quality of life. The Chinatown Clean Ambassador Program was created in conjunction with Asian Prisoner Support Committee, Asian Health Services, East Bay Asian Local Development Corporation, The Oakland Chinatown Chamber of Commerce, Family Bridges, Chinese Community United Methodist Church and The Martin Group. To become a donor and support the growth of Oakland Chinatown, click here! 3600+ Public Works cases closed in 16 months: cleaning up dumping, graffiti on City property, safety hazards and infrastructure repair needs. The Chinatown Ambassadors that lead our efforts are the most impacted members of our Oakland Chinatown community. We train and support our Chinatown Ambassadors so that they may better support our neighborhood through regular clean up services, community event production and community leadership opportunities. Our Chinatown Ambassadors form a communications network that informs and empowers all members of our community: merchants, residents, visitors and property owners. Together we work towards economic and cultural advancement of our commercial and residential areas. WORKING WITH OAKLAND HIGH SCHOOLS AND CHINATOWN MERCHANTS TO ORGANIZE THE SIDEWALKS AND MAKE THE PEDESTRIAN EXPERIENCE CLEANER, SAFER AND MORE BEAUTIFUL. Chinatown is a heavy pedestrian and sidewalk-oriented environment. Safety and visual organization helps businesses, shoppers and visitors of all ages. In response to narrow sidewalks and the need to support merchants with encroachment issues, we created the Produce Stand Design Contest. Launched in the summer of 2018, it is currently in production at Fremont High School Architecture Academy. 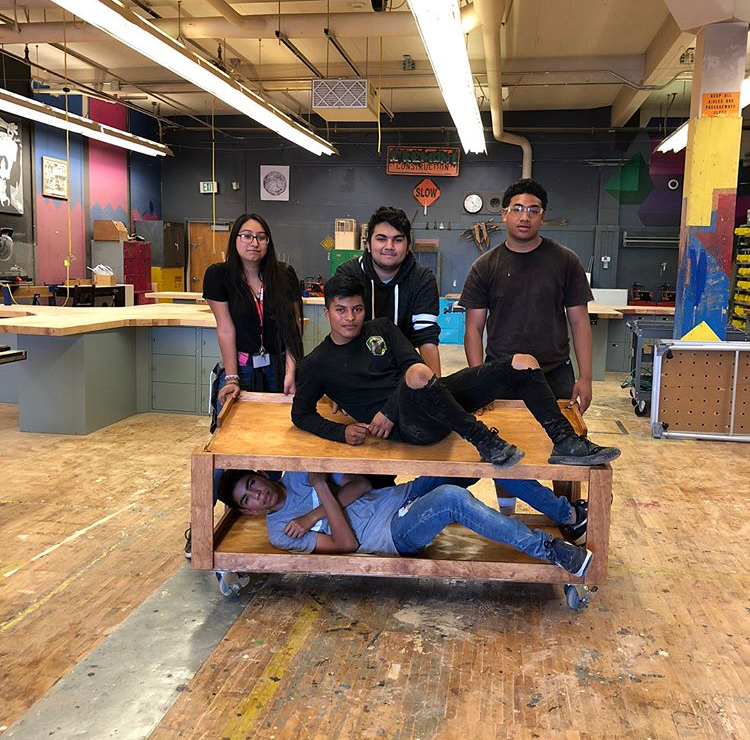 The Chinatown Improvement Initiative is working with staff and students from Fremont Academy and Laney Woodworking Department to design and build space efficient displays that respond to merchant needs. This will relieve sidewalk congestion and help visually organize produce into pleasing displays. Our test pilot stands go up in August 2018 with Yuen Hop Noodles and Hop Lung Market. Vacant spaces attract graffiti, litter and feel unsafe. Chinatown is dark. Lack of City pedestrian lamps makes for an unsafe night time walking environment. Our Vacancy Activation projects have yielded extremely positive results, with neighborhood safety and business attraction levels dramatically increased. Chinese American Citizens Alliance building on 8th and Harrison was chronically-tagged and unlit for several years. The Chinatown Improvement Initiative worked with owners to restore the groundfloor facade, remove tags and unsightly wood paneling, clean the adjacent sidewalks, open windows, and add public artwork and lighting. 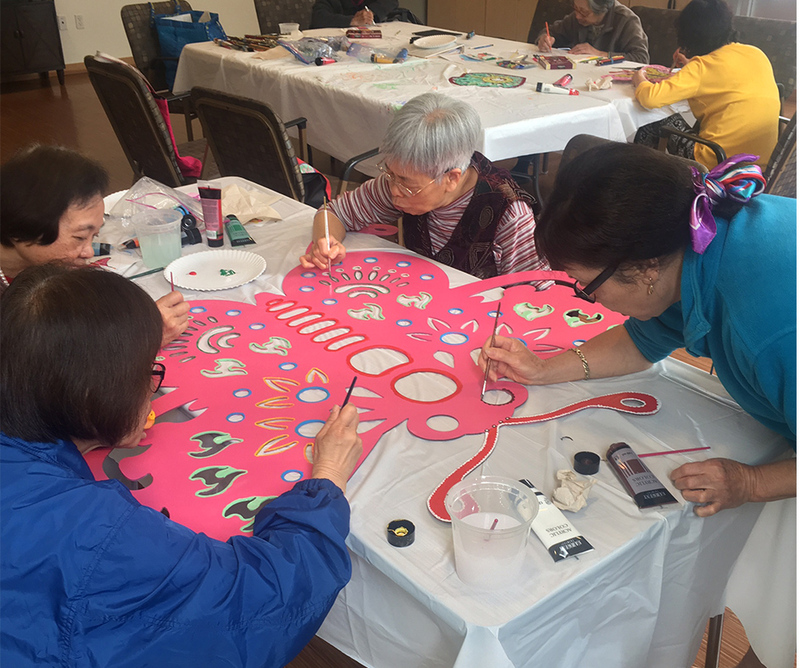 We coordinated the art installations and lighting with Castlemont Sustainable Urban Design Academy, and the Harrison Senior Housing Art Workshop, under the guidance of artist Ming Cheung. Graffiti has ceased on the facade since the improvements. It is well-lit and visually open at night. It has transformed from a blighted property to a highly-visible corner location, and has attracted many inquiries and tenancy proposals. Check it out during the OCA Monthly "PickItUp" Cleanup! The Yuk Yau Fence Project is a public art collaboration led by the Chinatown Improvement Initiative. It involves two generations of Chinese and Tongan immigrant artists, Yuk Yau CDC, Yu Ming Charter School, and SUDA Castlemont High School. 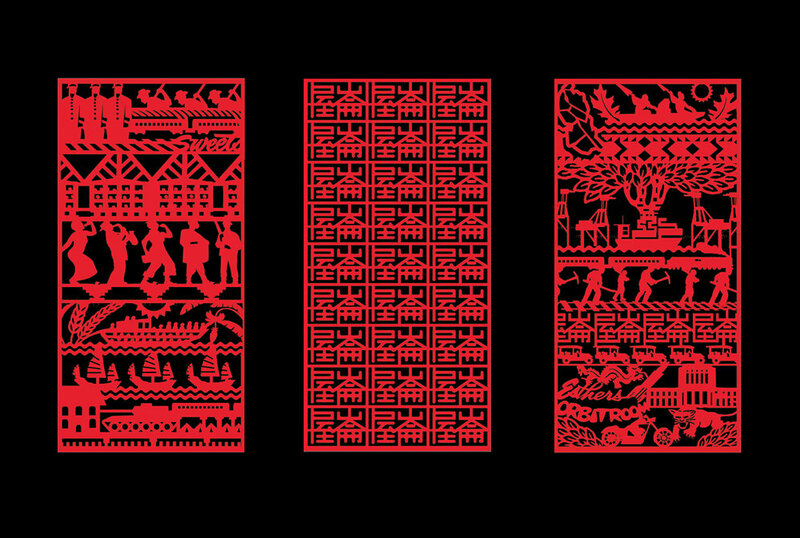 Thanks to artists Shu Yi Lu (Oakland Asian Cultural Center), Sandra Chang (Yu Ming), Jeadi Vilchis (SUDA FabLab) and Ofiu Fihaki (Civic Design Studio) for the beautiful work! Thanks also to Lailan Huen for the opportunity! Annual renewal of the fence, working with local schools and community groups. Solar panel lighting for the art pieces to add increased pedestrian safety during night times. Congratulations on a great summer and fall series! At our final event of 2018, we had over 1000 attendees, 70 volunteers and 25 community organizations and businesses participating. Looking very forward to 2019! every 1st Wednesday of the month in Chinatown Madison Park! 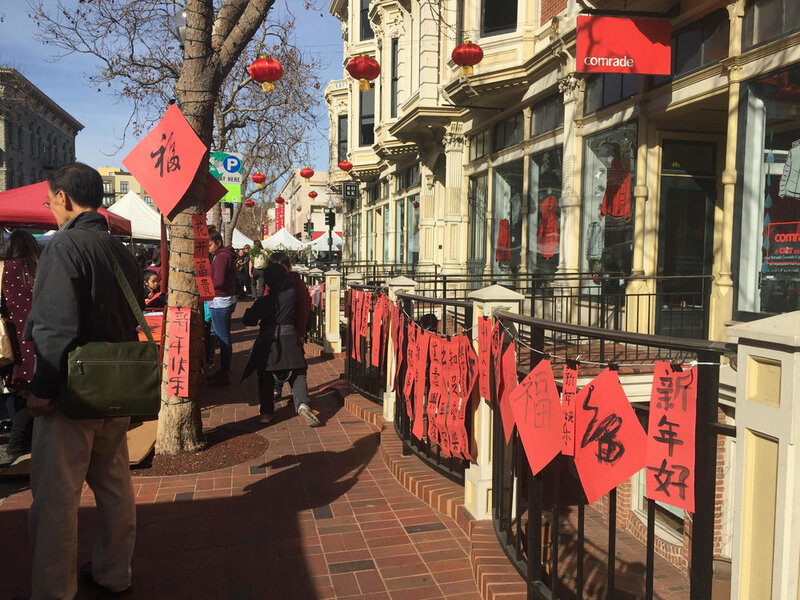 On Feb 2, 2018, the Improvement Initiative worked with the property owners in Old Oakland to celebrate Lunar New Year. It is the 2nd Annual Lunar New Year Celebration in Old Oakland adjacent to Chinatown. 9th Street at Broadway was lined with beautiful lanterns. Highly visible windows on the corner of 9th and Broadway displayed public artwork and giant Chinese paper cut carvings. The artwork, created especially for Lunar New Year, illustrate the history of Old Oakland and 7th Street in West Oakland. We also coordinate a lion dance celebration during the Friday Farmers Market. Once a vibrant part of Chinatown, in recent decades Chinese and Asian communities faced legal and personal discrimination in immigration, building and rental policies. We were thrilled to work with the owners to uplift our histories, and continue the cultural celebrations of the Asian communities that reside and spend time in the area every day. The Chinatown Improvement Initiative partnered with SFSU Graduate Studies professor Russell Jeung to begin an in-depth look at Asian business and residential migration patterns in Oakland Chinatown and the greater Bay Area.